Do you want to make your event spectacular without having to go through the stress and work that comes with providing a top-shelf dining experience? Then having your event catered is a must. 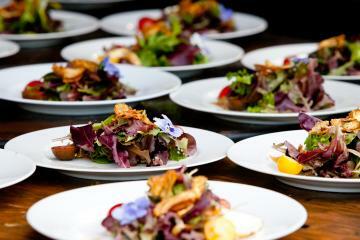 Only Chuckwagon Cuisine Catering Company can provide the true culinary experience you deserve. Your guests will experience an unforgettable meal as we redefine catering food as a sweet, savory, delectable, and tasty adventure. On your special day, let us worry about the tasty details so you can truly enjoy every moment. Our staff will help you design an extraordinary menu to make your wedding reception unique. 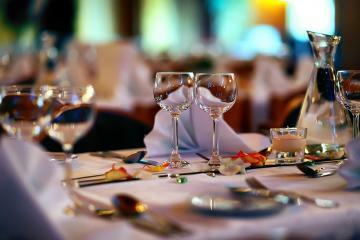 You will have access to a variety of menu selections careful crafted from gourmet recipes. Every tasty morsel will be prepared from the highest quality ingredients. It’s your wedding day after all. With an accomplished catering staff and a reception menu tailored to your needs, Chuckwagon Cuisine Catering Company will deliver exquisitely presented, scrumptious wedding food that your guests can’t resist. Chuckwagon Cuisine Catering Company can take your cocktail, theme or anniversary party to the next level with an original and visionary menu tailored to your specific needs. From buffets to sit-down dinners, our high-quality ingredients and impeccable preparation will give your guests a 5-star experience. 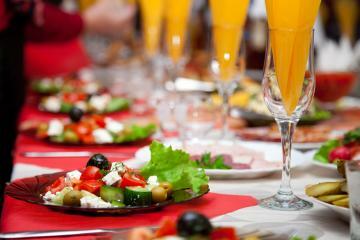 We can't wait to help you decide what to serve at your next party. Needing lunch or a corporate dinner catered? Let us provide you and your business associates with a culinary experience that will ensure you make an unforgettable impression. 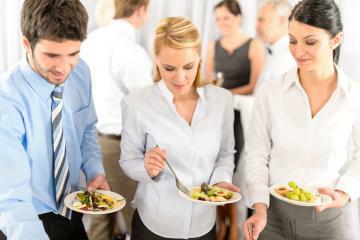 Whether you need luscious hor d'oeuvres or savory finger foods our unique catering presentations will create an enticing treat for the eyes as well as the palate. We understand that every event is unique. From casual to elegant, simple to extravagant, we will coordinate your special event with a menu in-tune with your theme and budget. Whether you choose appetizers, buffet style or a sit-down dinner, our full-flavored culinary delights will make your party the toast of the town.